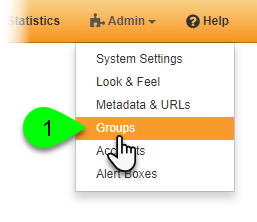 Each group in LibGuides CMS has its own separate look and feel settings that can be used to adjust the display of only that group -- including an option for setting a custom homepage template. The steps for creating and customizing homepage templates for a group are identical to those used to create a custom homepage template at the system-level. You can find those instructions here: Customizing Homepage templates. Locate the group you want to customize and click on its Edit () icon in the Actions column. Click on the Look & Feel and Layout tab and choose Group Homepage from the dropdown. 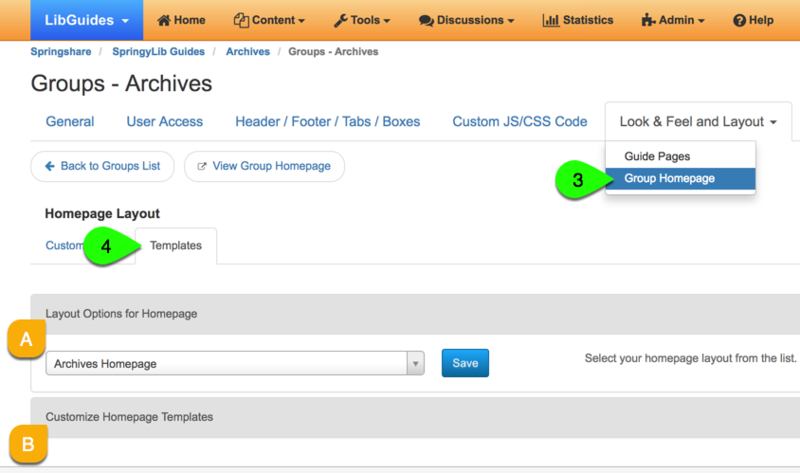 Select the homepage template to be used for the group under the Layout Options for Homepage panel. Customize an existing custom homepage template or create a new template under the Customize Homepage Templates panel. Note: all custom homepage templates can be used at the group-level and the system-level.